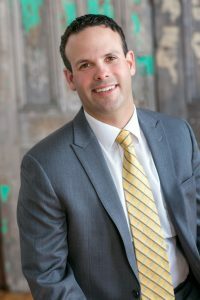 Following is a “Meet Your Board Members” interview with Stephen Hicks, Class of 2003. Steve is the current President of the Albion HS Alumni Foundation. Stephen Hicks graduated from Albion High School with the class of 2003. After high school he went on to attend SUNY Oswego where he completed his bachelor’s degree with a concentration in Finance. Steve was hired by Brighton Securities in the Summer of 2007 and has worked there ever since. Steve is a lifelong resident of Albion, only living elsewhere during his 4 years at Oswego. He lives in the village with his wife Rachel, son Mason and his two chocolate labs Mittens and Bella. Steve enjoys golfing and hunting and is an avid fan of both the Sabres and Bills. He looks forward to traveling with his wife, teaching his son how to golf and continuing to be active in the Albion community. Steve recently completed Leadership Orleans, and Rachel will be participating in the program next year. When did you join the board of directors and what is your role? I started volunteering with the Foundation in 2014 and was elected to the Board of Directors in January 2016. I was nominated and accepted the role of Investment Committee chairman and helped interview and select professional management of the foundation’s assets. In January 2018 I was elected Vice President and in October I replaced Chris Haines as President following his retirement. What sparked your interest in being a part of this board and what do you like most about what the Foundation does and your involvement in it? I wanted to volunteer somewhere where I could see my efforts making a difference. I had been involved on boards before where I was sort of in the background and didn’t really contribute too much. We have some great people within the foundation, but it was clear that they wanted younger people to take an active role and begin a transition to the next generation of board members. I saw this as an opportunity to step in to an already wonderful organization and help it continue to grow. I think helping kids have the best opportunity possible to succeed is one of the most important things we can do as a community. The foundation can make a difference in students’ lives and maybe push them to the next level. I think it is a great thing to be a part of. Tell us about your experience at Albion HS and how your experiences influenced you either in school or in your life after school. I enjoyed my time at Albion greatly. I made wonderful friendships, many of which I still have today. I wasn’t always the best student during my time at Albion. I took for granted that I was a good test taker and had a mind for numbers and I used that to get by. In many classes I didn’t apply myself the way I should have. I wasn’t always the most respectful student in the world and often felt like I knew more than everyone so why did I need to listen. I look back on that with some regret. If I could go back and talk to 15-year-old Steve, I would tell him that these years are important, the way you apply yourself is important, and the way you treat other people might be the most important of all. Unfortunately, I can’t do that, but I’m hopeful that in this role I can help kids and impact them in a positive way. I’m hopeful that I can be a good role model to my son and that he figures things out at a younger age than his dad did. What motivated you to go into the career you chose and what led you to your higher education choices? That part was easy. I always liked numbers. I thought accounting would be a good role for me, but I realized that although I enjoyed numbers, I didn’t necessarily want to spend all day with them. I liked talking to people and I liked helping people plan things and come up with strategies. I was fortunate because my uncle and namesake Steve Harling had been in finance and he let me shadow him and learn about his career. He introduced me to Jeff Rheinwald who had been the President of Albion Federal. Jeff taught me a great deal about the stock market as well as working hard and building relationships. I really didn’t give it much more thought after that. I knew I wanted to be a Financial Advisor, and I don’t think I’ve ever questioned it- even during 2008. Brighton Securities hired me in July 2007 and I’m proud to say I’m still here today as a Vice President. What advice / words of wisdom do you have for our current students and recent graduates? I think kids are prone to act on impulse and how they feel on a certain day. I would tell them that they should always keep in mind what they want their lives to look like down the road and to remember that the choices that they make today can have a great impact on the future that they envision- positively or negatively. Also- because what type of advisor would I be if I didn’t talk about money- they should save early. Even if it is just a few dollars per month. Start early and give your investments plenty of time to grow. And if you have a retirement plan through work, make sure you put in whatever you need to in order to earn the full company match. It is the easiest money you’ll ever make, and it might mean you can retire a few years earlier.